Using Team Foundation Server , Visual Studio, to increase productivity and transparency into your application as well as increase the rate at which you can ship high quality software throughout the application lifecycle. In the Following whitepaper is described How-TO: Using TFS to support epics, release trains, and multiple backlogs. The Scaled Agile Framework, or SAFe, is popular among organizations looking to scale Agile practices to the enterprise level. SAFe is a comprehensive framework, covering practices from portfolio level planning to release planning to coding practices. The first two sections are conceptual and provide a quick overview of how TFS supports SAFe.The last two sections are guidance and provide detailed steps for the TFS Administrator to configure and customize TFS to support SAFe. SAFe supports a portfolio view of multiple agile teams. SAFe illustrates how a portfolio vision is met by a hierarchy of teams, all of whom have their own specific objectives. This framework breaks down Epics into Features and Stories, which teams work on in Sprints and deliver through Program Increments (PIs) and Release Trains. Also, the portfolio backlog can track how deliverables map to Strategic Themes and associated budgets. Image courtesy of Leffingwell, LLC. The examples in this paper illustrate how to add the Epic WIT and backlog, configure a three-level team hierarchy, and map teams to their respective area and iteration paths. 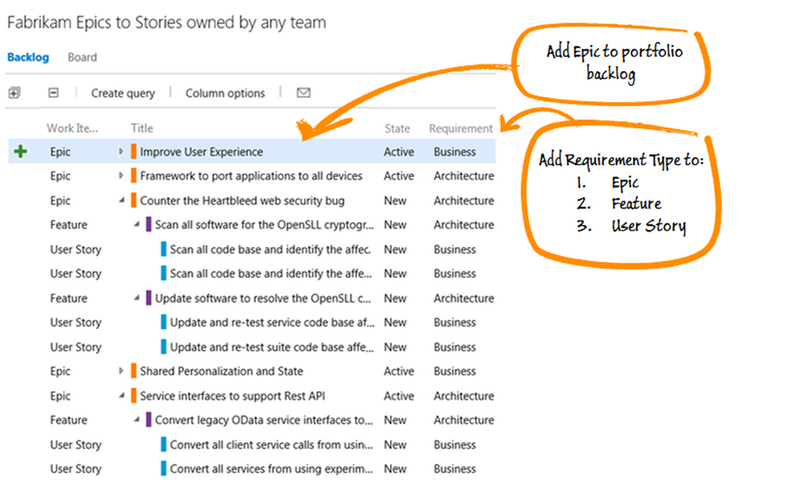 The examples build from the TFS Agile process template. However, the changes can be applied to any TFS process template. Because TFS supports a hierarchical team structure, each team has its own view of their work which rolls up to the next level within the team hierarchy. In the section, “Customize TFS process to support SAFe”, details the changes to our Scrum, Agile, and CMMI process templates which enable SAFe support. The goal is not to create a SAFe Process Template, but modify existing process templates to enable SAFe practices. This changes are minimal and don’t encumber teams who choose not to use SAFe. You can download the standard Scrum, Agile, CMMI process templates with changes for SAFe here. If you have customized process templates, you can follow the instructions in the guidance. Additionally, in this blog post shows how to automate the process with PowerShell. This whitepaper assumes a familiarity with the Scaled Agile Framework. If you’re familiar with Scrum but not familiar with SAFe, Inbar Oren has published these great videos which explain the basic SAFe concepts quickly. This entry was posted in ALM, Development, microsoft, Technologies, TFS, ALM and tagged TFS;alm;team foundation server by dumianski. Bookmark the permalink.